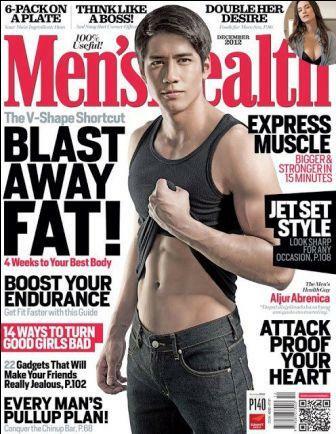 Aljur Abrenica Shows His 6-Pack Abs on the Cover of Men's Health Mag! For the second time around, the Kapuso hunk actor Aljur Abrenica graces the cover of Men's Health magazine December 2012 issue. Aljur is sexier on his second cover. He exposes his sizzling yummy abs while wearing a black sando. Aljur just recently starred in the Philippine adaptation of the hit Koreanovela series "Coffeee Prince" with onscreen partner Kris Bernal. He is also part of the 2012 Metro Manila Film Festival entry "Sosy Problems."